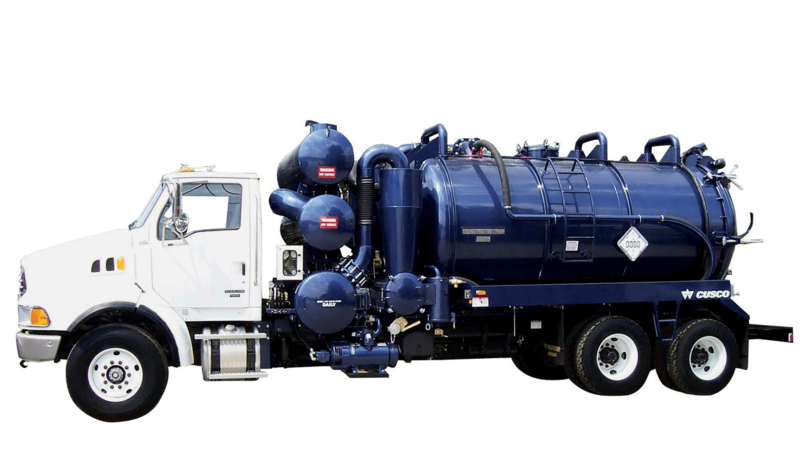 Our Turbovac series trucks are ideal for environmental remediation work − they’ll handle heavy sludge, slurries and liquid waste materials without compromise. With cyclonic filtration technology, airflow ratings of 1,800 CFM to 5,500 CFM, and powered with 28″ Hg of vacuum, this system is your solution to the most complex hazardous and non-hazardous waste removal, transportation, and remediation problems. Available Options: High-pressure wash system, stainless steel tank construction, hydraulic suction boom, heated valves, pressure unloading systems, storage cabinets/toolboxes, DOT 407/412 and TC 407/412 configuration. Required Front Axle: 18,000 lb. 20,000 lb. 20,000 lb. Required Rear Axle: 46,000 lb. 46,000 lb.